EACv Skotas as seen in Inferno Nostos. 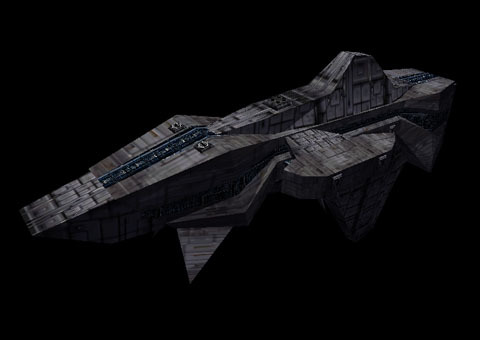 The EACv Darkness is an Earth Alliance corvette with very heavily shielded turrets and formidable anti-warship beam cannons. Although less well-armed than the Phobos, the Darkness-class, the EA's sole corvette, is nevertheless a major threat to opposing capital ships. Multiple medium cannons adorn her port and starboard quarters, a configuration similar to that of our Alexandria model. 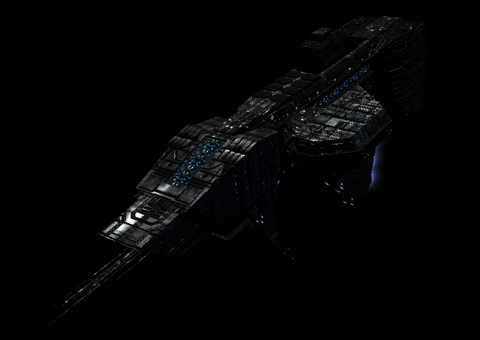 Anti-subsystem strikes on the Darkness' turrets are practically futile, as they are very heavily shielded. Although less well-armed than the Phobos, the Skotas-class of light corvettes is nevertheless a major threat to opposing cruisers and corvettes. Its Geodess missile system can attack any warship from extreme range and from almost any angle. Heavily shielded turrets on the Skotas will frustrate most attempts to disarm the corvette, so most commanders prefer to destroy it or chase it off rather than secure it for infiltration and capture. As the tech description says, turrets are very heavily armored, with the exception of the Stinger launchers, making it rather difficult to disarm them. However, they aren't too dangerous to you or your friendly warships in the missions they appear in INFR1. Simply take out their stinger batteries and you can safely ignore them most of the time. The HTL model has eight huge submarine-style VLS tubes from which it can launch long-range torpedoes on the dorsal surface (where a stinger launcher used to be), but otherwise has an identical turret layout. This page was last edited on 18 December 2018, at 03:58.